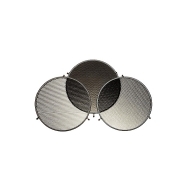 The range of accessories for the L40 standard reflector for Siros became expanded. Not only honeycomb grids with different light angles are available but now also a barn door with 4 wings. By a simple tension spring the barn door is safely fixed in the reflector; nevertheless, it can be rotated by 360� and, therefore, may be put into any required position. 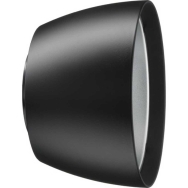 The wings are cut in a way that they may be shut closely and then prevent optimally from undesired, laterally emitted stray light, similar to a simple conical snoot. On request, every single wing can easily be removed from the base plate - and the mounting is not more complicated later on. 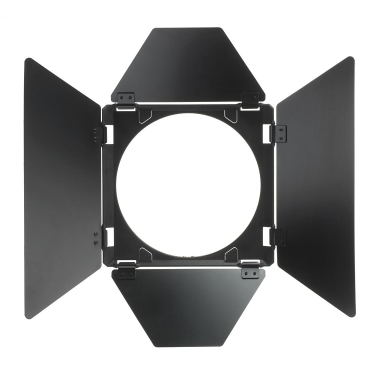 Each angle of the base plate bears also a clamp - therein, square filters with a side length of 17.6 cm may be mounted perfectly.